Fallout 4, Bethesda’s new title in the post-apocalyptic world game series, will be launched on November 10 for PC, Xbox and PS4. The game promises several hours of gameplay, besides missions more electrifying than in previous titles, like Fallout 3 and Fallout: New Vegas. Want to know more about the production? Check out the information released so far. The plot of Fallout 4 is set in Boston, in the United States, and presents the world before the war that devastated the country and brought chaos to the citizens. To complete, users speculate that the character created at the beginning of the game is an ancestor of that controlled in the traditional universe saga, full of ruins, mutants and radioactivity. Among the new features, the element that should make the joy of the players is the high level of customization of characters in the game. The developer revealed that, in addition to being able to create the protagonist with many editing options, the user can also build houses, weapons and customise the garments worn by the hero. In addition to improved graphics, the German Shepherd dog can be used to search for items, help in battles and company to the protagonist. Fallout 4 will offer up to 12 characters controlled by the PC that will accompany the hero and the dog in any way. As in another production of Bethesda, The Elder Scrolls v: Skyrim, you can recruit others to help the protagonist during the fighting, carry things, among other functions. The more curious about the novelty of Fallout 4 is that the hero can develop romantic relationships with these companions, regardless of genre. There is only one restriction: the partner (a) must be humane. The company has not yet confirmed exactly how the tool works, but the relationship is expected to unlock advantages to the player. One of the greatest traditions of titles released by Bethesda's variety of mods created by the community of players. It worked in Fallout New Vegas, shone with TES: Skyrim and promises to be one of the high points of Fallout 4. In addition to the PC version, PS4 and Xbox editions One also will allow installing mods created by other users. The developer yet confirm how the facility will work, but if you want to change the game, the company itself will support the process. Fallout 4 was announced during E3 and, with him, the collector's Edition. 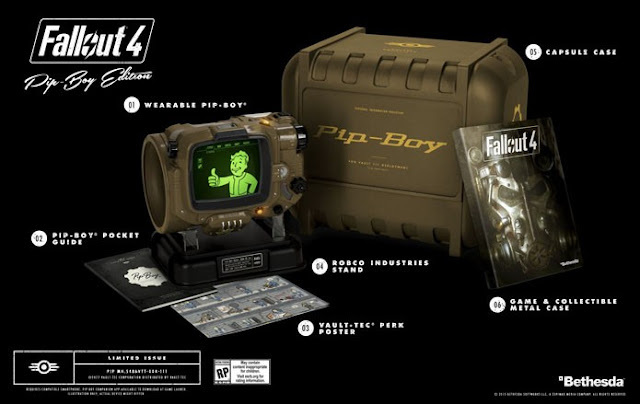 Customers were waiting for packages with posters and, perhaps, Vault Boy figure, mascot of the series, but the manufacturer decided to surprise and revealed a Pip Boy in actual size to accompany the game. For those who don't know, Pip Boy is the name of the device used in the arm by the characters of Fallout, with all the information of the universe of the game, such as maps, equipment, data from enemies and cities visited. S.P.E.C.I.A.L is an abbreviation for the seven attributes in the game. You can see below. The craft to carry melee weapons. Bonus damage in close combat. Enemies track and identify vulnerabilities. Resistance to poisoning and radiation.